John Hugh Selleck was born in Billings, Montana . He initially studied at the School of Music at the University of Montana, Missoula with Eugene Weigel, a former pupil of Hindemith. 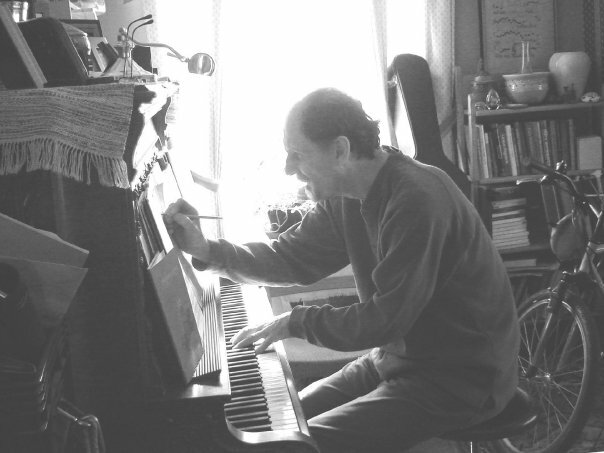 After graduating with a Bachelor of Music degree with a double major in both piano and composition from the University of Montana, he received his Master of Music degree from the Yale School of Music where he studied with Elliot Carter, Francis Judd Cooke, Allen Forte, Janet Knapp, Quincy Porter and Mel Powell, and piano with Donald Currier and Seymour Fink. While there he had a paper published in the Yale Journal of Music Theory and won the Woods Chandler prize for the best work in a large form (a piano trio). He then received his Doctor of Musical Arts degree from Columbia University at the School of the Arts. While there he studied with Chou Wen Sung, Bulent Arel, and Mario Davidowski. He continued computer music studies with a Princeton colleague, Charles Dodge and at the suggestion of Benjamin Boretz wrote a paper on the String Quartet of Lutoslavski for the Princeton music journal: Perspectives of New Music. He was also the coordinator of a colloquium involving matching performing groups with composition students. He was granted a Composer's Forum performance shortly after graduation. He married Joysanne Sidimus who had danced with the New York City Ballet and, as principal dancer, with the Pennsylvania Ballet and the National Ballet of Canada. They moved to Winston-Salem, North Carolina where he worked temporarily as a pianist at the North Carolina School of the Arts. He subsequently became the senior financial systems analyst for the city of Winston-Salem but continued to compose, many of his works being premiered at the annual Composers Symposium at Salem College.Their daughter, Anya Janine,was born there. After 8 years in Winston-Salem, they emigrated to Canada and he continued in I.T. at several positions, notably the City of Toronto, ISM (IBM), and BCE. He has also worked as a music copyist, orchestrator and arranger, producing a revision and enhancement of Rebikov's opera, The Little Match Girl to form a full-length ballet. Some of that music was premiered at a concert at Lehigh University in Pennsylvania. The entire ballet was recorded in St. Petersburg, Russia. Having retired from data processing work, he now exclusively performs, teaches and composes. He is the pianist for Trio Bravo, a Toronto-based performing group including also Baird Knechtel (viola) and Terry Storr (clarinet). The group has performed his Fantasie as well as other original works and many arrangements. As a composer his works have been performed more recently in Montreal at a viola conference and by the Cathedral Bluffs Symphony, the York Chamber Orchestra and the Sunrise String Quartet. As a pianist, he continues to perform his own piano and chamber music works at various venues in and around Toronto. Copyright 2012 JHS Enterprises. All rights reserved.